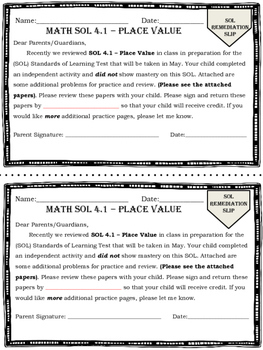 This product is designed to let parents know which SOL objectives their students need additional help in while prepping for the Virginia Standards of Learning (VA SOLs) in MATH. This can be attached to extra homework or previous assessments to show parents the mistakes their child made and will help justify why the additional support is needed. SOL 4.1 - 4.16 Math Objectives included!! 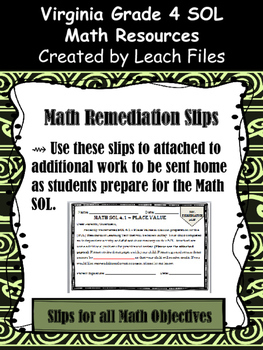 This can also be used by Title I or Math tutors to let teachers know the SOL objectives that their students are struggling with and how they can plan future whole or small group instruction to support them.